John Paul Tancredi was born in 1965 in Santa Monica, California, and grew up in nearby Pacific Palisades. After graduating from Loyola High School in Los Angeles in 1983, he spent the next four years having the time of his life at UCLA. It was during this time he realized how fun it would be to someday write a book about his experiences. He kept an informal diary which would later become the foundation for his first book, North Campus Days. He graduated from UCLA in 1987 with a Bachelor's degree in Political Science. After graduation, the author worked in the insurance industry as a technical writer and instructional designer. Along the way, he earned his MBA from Pepperdine University, but didn’t find that experience especially book worthy. Today, he has his own writing business (JohnPaulTancredi.com) and continues to work on various creative writing projects. Mr. Tancredi currently resides in Brentwood, California, not far from the UCLA campus. John Paul began working on North Campus Days in the mid-1990s and finished the manuscript as the century drew to a close. The print edition was published in November 2000, with an updated ebook edition published in September 2010, coinciding with the book's tenth anniversary. He feels it is an entertaining, enjoyable read that really captures the spirit of his college days. 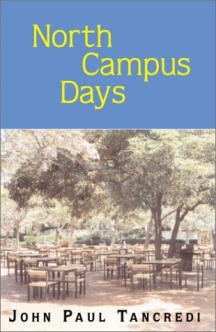 To contact the author, you can reach him by email at:JPT@northcampusdays.com.